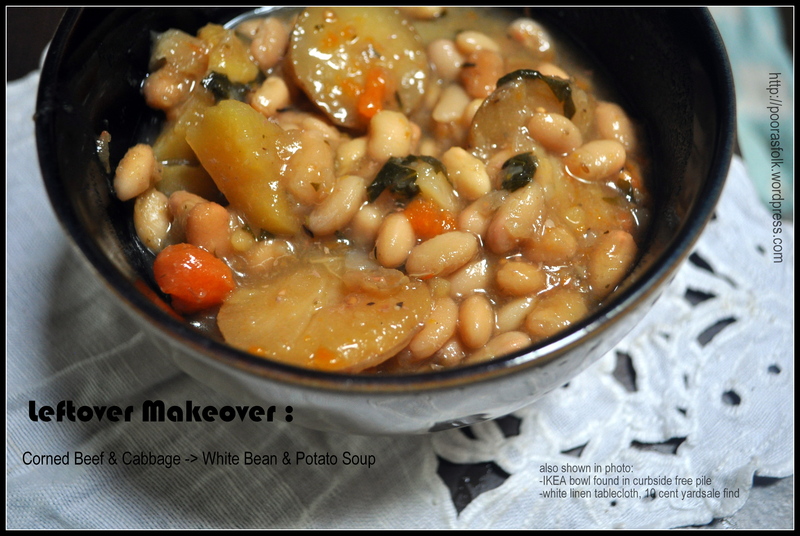 Sometimes leftovers are great for lunch the next day or a Leftover Night. Sometimes they need a makeover. Especially with bigger than average families where what’s leftover isn’t enough to feed everyone. This week, I was talked into making Corned Beef and Cabbage for dinner because “it’s what we ate on St. Patrick’s Day when I was a kid!”, said my nostalgic and traditionalist husband. It’s kinda my job to hate everything that everyone else seems to love, and St Patrick’s Day is no exception, as much as I love apocalyptic visions. But I love my husband and hate to hear him whimper about missing out on some food thing, so I made his damned beloved Corned Beef and Cabbage. I tend to go to my pantry first before running out to buy something specific for a recipe, so that day I happened to have a partial bag of potatoes that were looking sad and begging to be used. 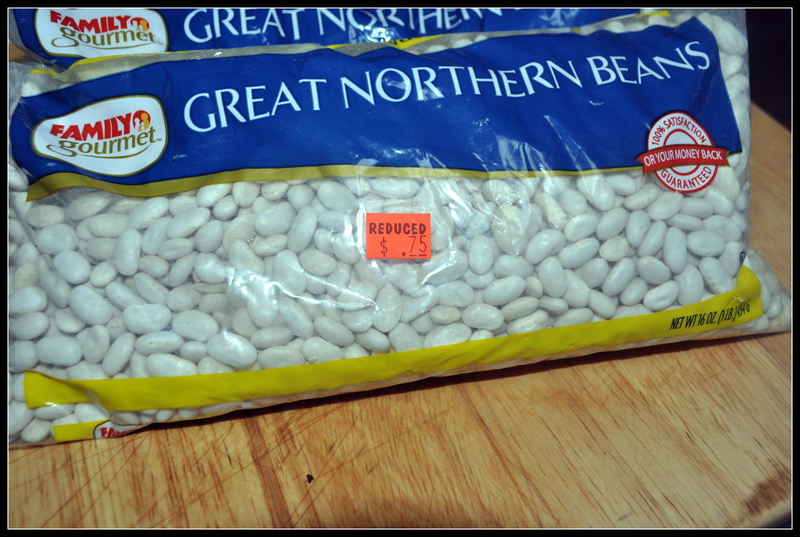 I also have 22 lbs of assorted dried beans in my pantry (it’s quite possible that food insecurity has made me a paranoid food hoarder, which might explain why I get along so well with the Doomsday Prepper crowd ), so I decided to add some Great Northern Beans. Good thrifty score on those recently at my local dollar store…. 75¢ per bag, which is half price. So, here’s what I did: Threw all the liquid and the leftover veggies from the corned beef back into the crockpot, chunked up potatoes, and added the beans after quick soaking them . I added just enough water to cover the beans and everything else, which also helped dilute some of the saltiness. Threw in some typical herbage… oregano,garlic,a little lovage. Set temp for 6 hours on high. That was it. I didn’t really even have to add cornstarch as a thickener at all. Not too much broth in my bowl because I like it that way. It was dee-lish. Fed the whole family plus enough leftover for lunches for the hubby the rest of the week. We rescued a metal cabinet from the curb last summer. It’s pretty much just for the beans. The panini press & blender are also in there but yep,mostly beans! How do you quick soak the beans? I only have success with dry beans if I soak them overnight and then boil them for about an hour. The soup looks great, by the way!